It’s a bird, It’s a plane, It’s Doctor Steven Hawking!! 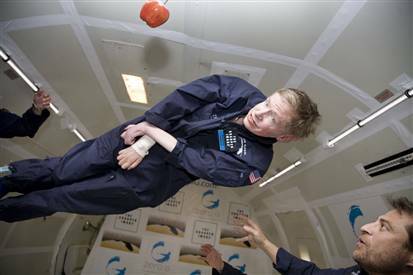 We’re all basically morons when compared to the great Dr. Steven Hawking (Sir), a man so smart, his minimally moving pinky can likely control gravity and crush us with but a thought. I’m sure by now you’ve read that he got to take a trip on the vomit comet thanks to some nice people at Zero gravity Corp and Peter Diamandis (you may remember he worked on that little X-Prize thingy). Talk about getting some great free publicity. Doctor Hawking fascinates me in many ways, most of all, that he is such a survivor. I have a good friend that lost his mother to the same affliction, and well, his survival and ability to thrive is beyond amazing (Yes the A.L.S. people do have info on him that will hopefully help others). Anyway, they took him up on the vomit comet for a ride yesterday. They were going to give him one go at it then see how he felt, if he was ok, they’d go for more. Just be careful, he’s going to ask to live up there, and be the voice of the computer on the space station or something next. Not to be pedantic, but isn’t it Professor Stephen Hawking, rather than Doctor? He got his Phd. first, (then became a professor). I also believe he’s been knighted, so Sir fits as well. It doesn’t really matter all his friends just call him Steve anyway.